Prep Time: at least 30 minutes to get everything ready, plus another 30 minutes for baking. First, make sure you have a defrosted sheet of pastry dough ready to go. If not, take it out of the freezer now and let it thaw out. 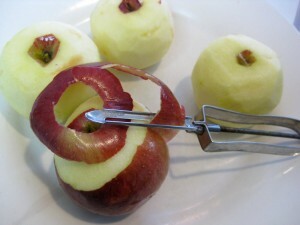 Take the apples (jablká) and peel them. Next remove the stem and the core. The lady in the video had a neat core-removing contraption, but I just used a knife. I started by cutting off a wedge from both ends. I then cut through and then “drilled” the core out by twisting the knife back and forth. 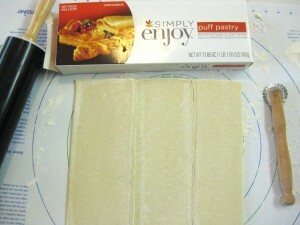 Next we make the filling. 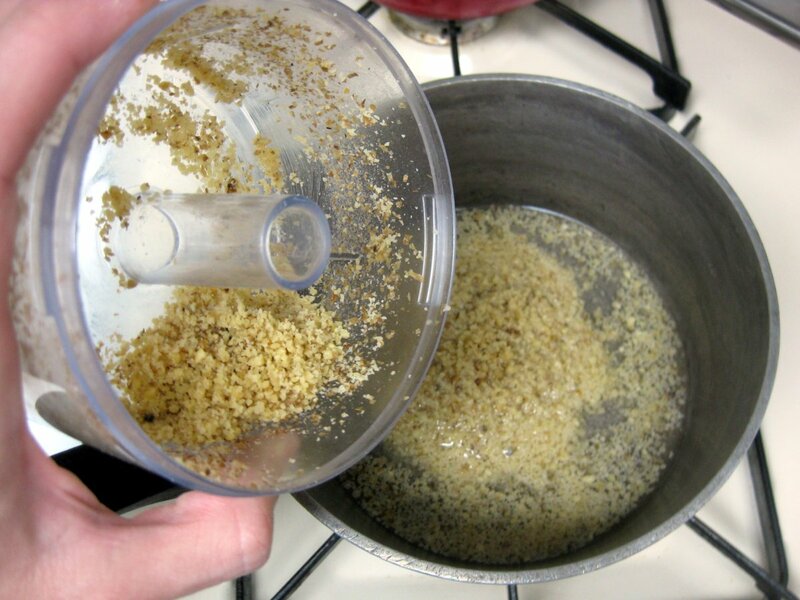 Grind up two handfuls of walnuts (orechy) in a food processor. Combine in a pot with quarter cup of water (voda, you could also use milk), two tablespoons of powdered sugar (práškový cukor), and a teaspoon of lemon zest (citrónová kôra). The original recipe also called for a bit of rum. I didn’t do this since I didn’t have any. 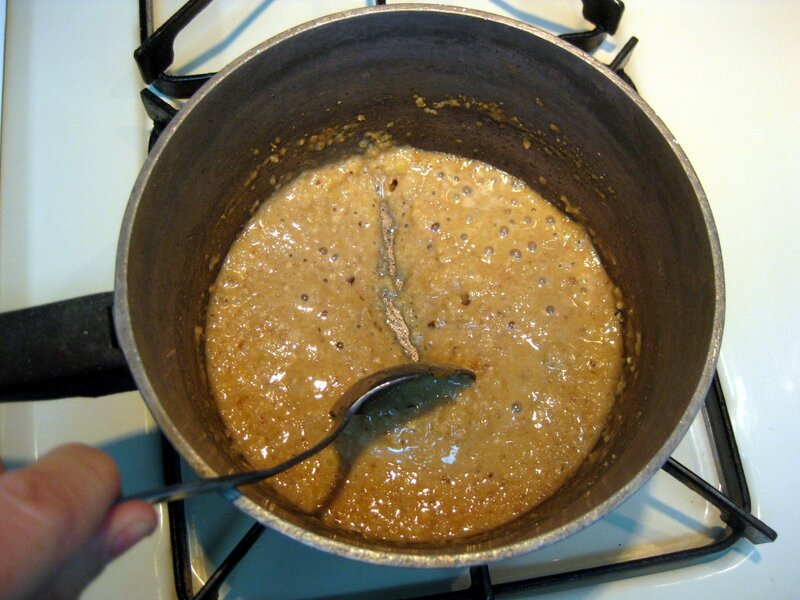 Cook the paste together until it’s like honey. 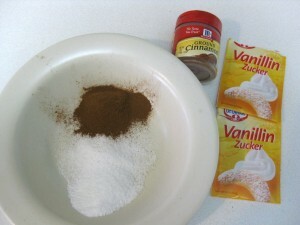 Also mix two packets of vanilla sugar (vanilkový cukor) with two tablespoons of cinnamon (škorica). At least that’s what the recipe called for. I ran out and had to make more (using regular sugar). I think that for 9 apples you need at least twice this amount. 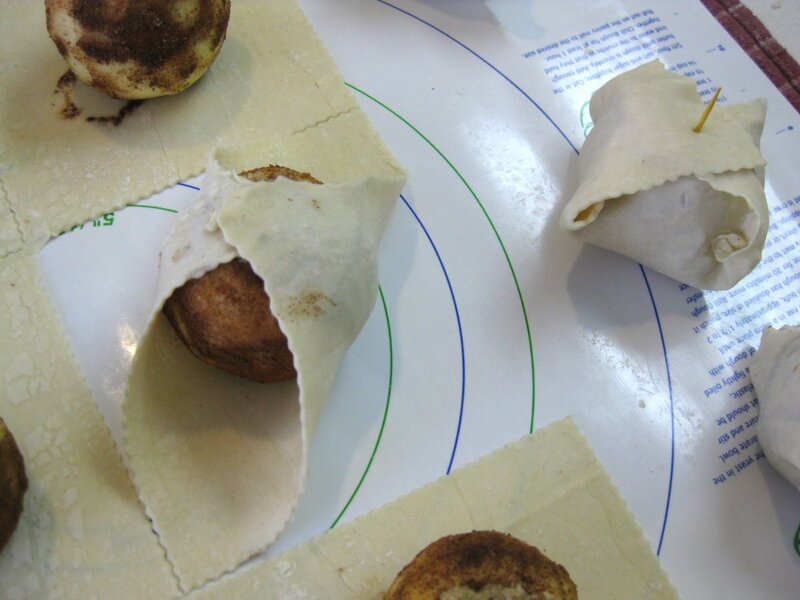 Roll out the defrosted sheet of puff pastry dough (lístkové cesto). 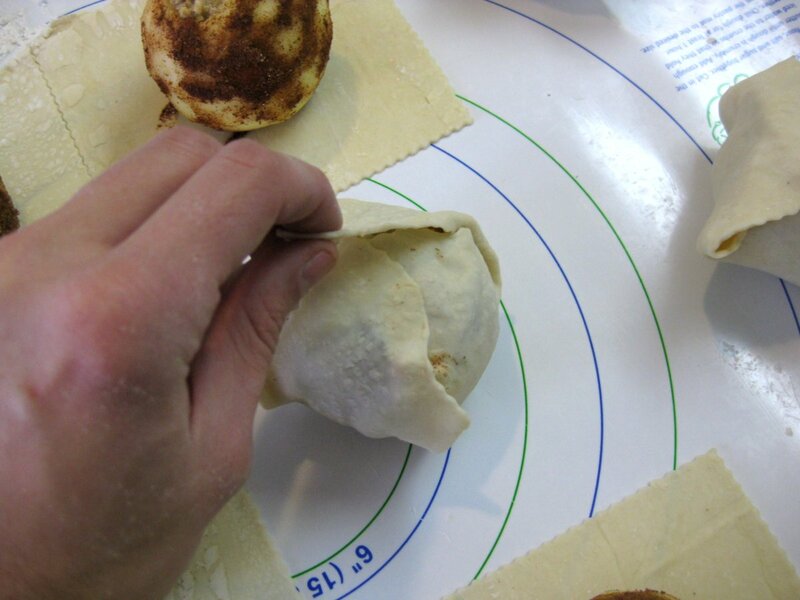 Flip it over few times, dusting the surface with flour to keep the dough from sticking. I rolled it until it was thin enough for the markings on the mat to show through. Cut it into 9 squares. Place each apple, coated in the cinnamon sugar mixture, at the center of each square. 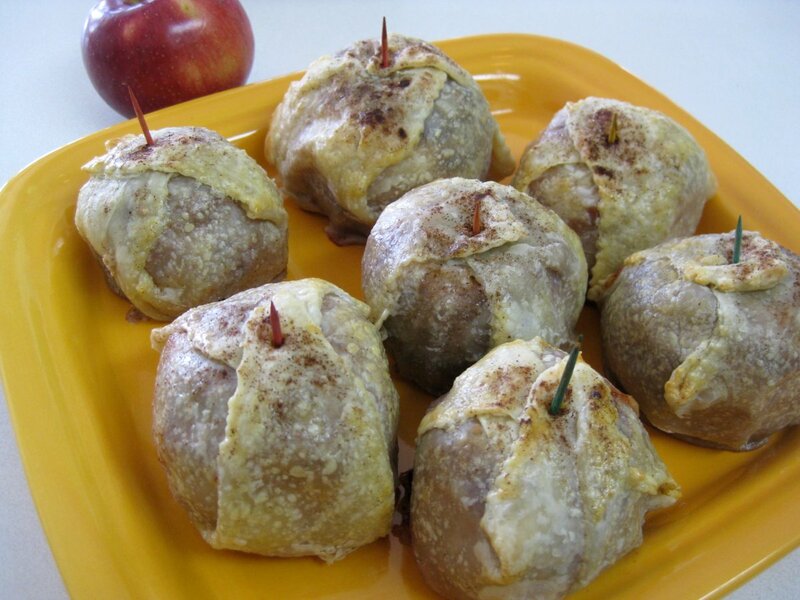 Fill each apple with the nut filling. 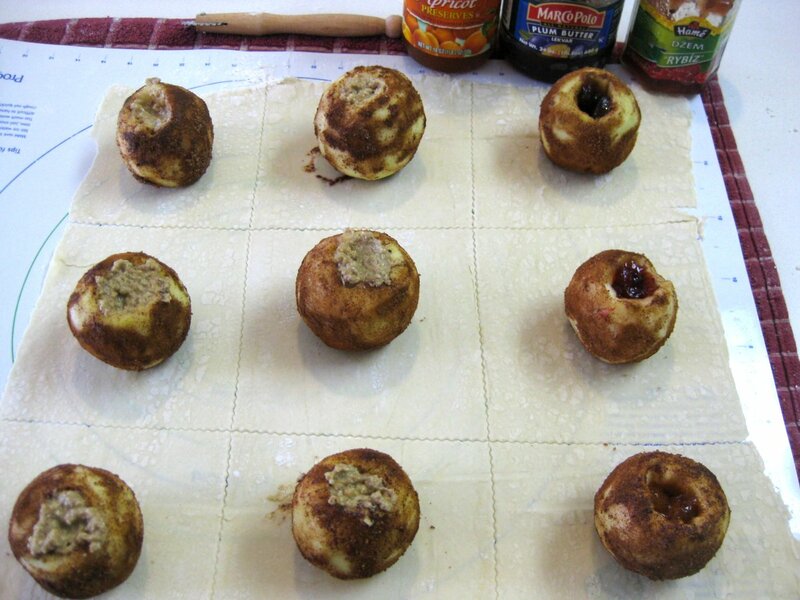 I didn’t have enough for all the apples, so the last three apples got filled with currant, plum, and apricot jams. Alright, almost done! 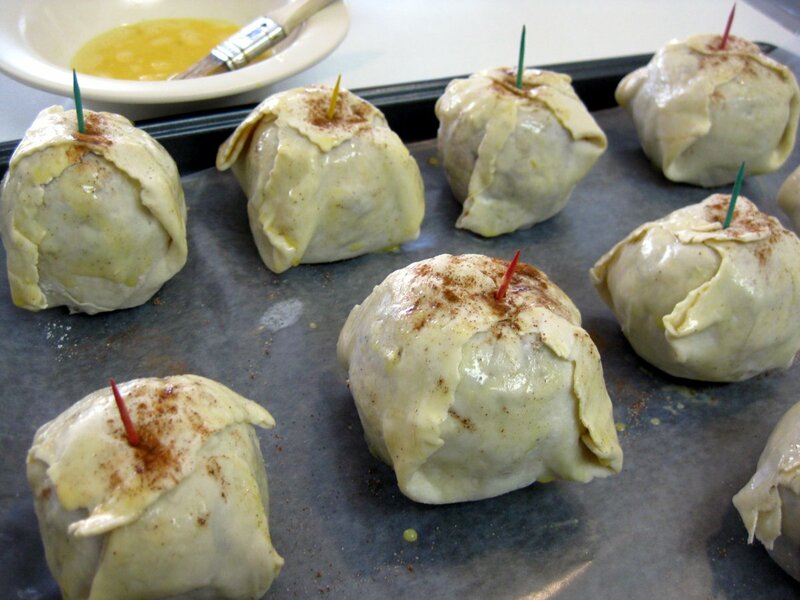 You just have to wrap the apples in their “bathrobe”. Do this by folding two diagonal ends together, and then cover with the two remaining ends. When folding the second time, try to tuck in some of the dough that will stick out along the crease. Place a toothpick in the middle to keep the robe together. Cool! So, I’ve had about 4 of these so far. I think I prefer the jam-filled ones to the nut ones. I am not too much of a fan of the lemon zest and nut combo. Maybe I used to much, or perhaps the lemon zest balances with the rum which I didn’t include. So when you make these, flavor to taste. Hi Lubos, I just now noticed you comment about the step-by-step decryption of decorated eggs. Of course, gladly. May I send you to your mail address? I have never heard of “vanilla sugar”; can we buy here or what would be a good substitute—regular sugar and some vanilla extract? Thanks. Hi Beth, you should be able to find it in European deli/grocery stores. These particular packets are from German Gourmet here in Northern Virginia (Arlington). But before, I used to substitute powdered sugar and a half teaspoon of vanilla extract. The result is not quite the same, but it’s a close substitute. The main difference is that vanilla extract is brown and contains bit of alcohol, while this sugar is pure white in color, and if I am not mistaken, alcohol free. Thanks Lubos! I’m not sure we have one here in Florida; but i just happened to find this by chance when looking up some recipe, etc. It had how to infuse your own vanilla Sugar.! Thought I’d share! My mom thought me to make these little different. 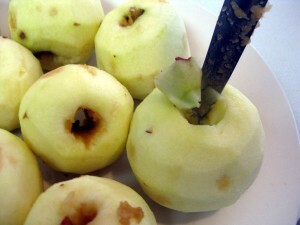 I slice the cleaned apples in about 1-1.5 cm slices so the de-pitted portions stay in center. I dip them in a thicker pancake batter (palacinkove testo) and fry them in oil. I sprinkle them with Vanilla sugar and serve hot. Jonatham Apples should be the best to use for Jabľčka v Župane. For the vanilla sugar – I buy either Vanilla sugar packets @ Amazon.com or I buy Vanilla sticks again @ Amazon.com and make my own vanilla sugar. I am so glad there is internet and that people can share recipes, experiences and that we can buy most of the ingredients on the internet if they are not sold in local stores. Again, thank you for all the recipes Lubos. Yes that is the variation what mom made and I do once a while as well. They are really good and dissapear from the plate very fast.